The U.S. 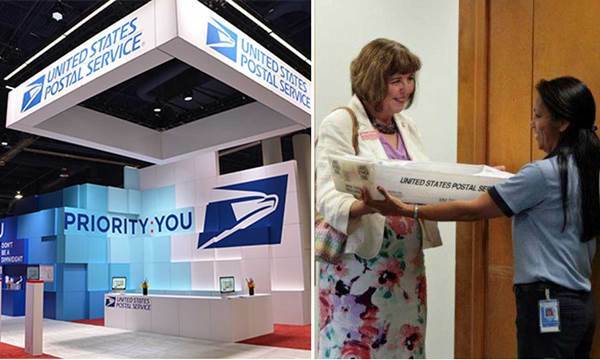 Postal Service hosted a highly-praised exhibit (left photo) at the 2015 Consumer Electronics Show in Las Vegas earlier this year. Helen Simmons (left), founder of Write2Them, presents a tray of letters for military recruits to Colorado Springs Air Force Academy Post Office Sales & Service Associate Agnes Martin. Hear about the Postal Service’s growing influence within the world of electronic innovation in the newest edition of Your Postal Podcast, available now at YourPostalPodcast.com. USPS Vice President, Sales Cliff Rucker explains the reasons behind the Postal Service’s presence at the recent Consumer Electronics Show and how the mail is playing a growing role in the electronics industry. Both the audio and transcript versions of this edition and an archive of previous shows of Your Postal Podcast are available at YourPostalPodcast.com. Listen to Your Postal Podcast on your mobile device at YourPostalPodcast.com/mobile, or search “Your Postal Podcast” at the iTunes Store. Thanks for listening to the Podcast -- and don't forget to visit Your Postal Blog for daily updates on all things postal.